Indonesia takes center stage as it hosts of the World Trade Organization (WTO) Ministerial Meeting (3-6 December 2013). As you know, This forum is being convened in the midst of the global economic, financial, climate, energy, food and political crises confronting the world today. But these forums will not deliver real solutions that will steer the world and the people from the multiple crises as they push for more of the same recipe that have brought upon the multiple crises – more liberalization, deregulation and privatization – which will result in greater impacts to the peoples and planet. They using neoliberalism to push and strip down the national capacities of countries for their intention, trade and market monopoly. 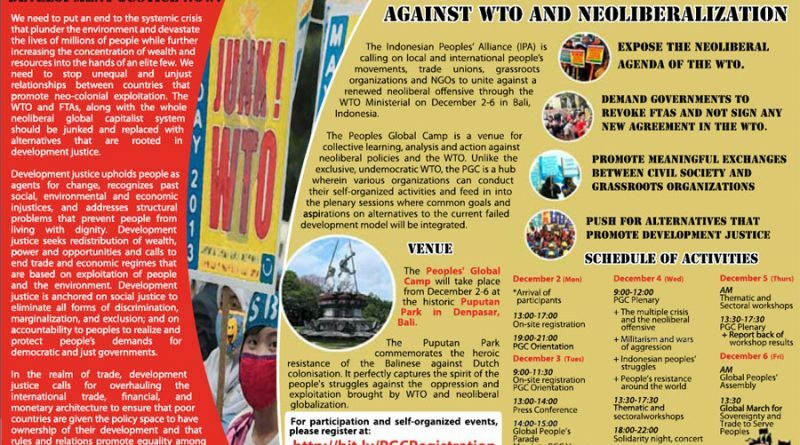 Against WTO intention to renewed their neoliberal offensive, mass organizations, civil society organizations and social movement in Indonesia, and international, joint forces to organize a broad platform of campaign against 9th WTO Ministerial Meeting, called Indonesia Peoples Alliance (IPA). IPA will organize Peoples Global Camp (PGC). The Peoples Global Camp is a venue for collective learning, analysis and action against neoliberal policies and the WTO. Unlike the exclusive, undemocratic WTO, the PGC is a hub wherein various organizations can conduct their self-organized activities and feed in into the plenary sessions where common goals and aspirations on alternatives to the current failed development model will be integrated. Therefore, the Indonesian Peoples’ Alliance (IPA) is calling on local and international people’s movements, trade unions, grassroots organizations and NGOs to unite against the renewal of the neoliberal agenda at the WTO Ministerial on December 2-6 in Bali, Indonesia. IPA invites these groups to come at the People’s Global Camp that will be organized as an alternative gathering in Bali that will run in parallel to the WTO Ministerial. Your participation in PGC will become significant contribution to end neoliberal globalization campaign. Do not hesitate to contact us, for inquires you may reach us at sekretariat.ipa@gmail.com.